Relax… You’re at Spur Valley Golf Resort! Discover Spur Valley Golf Resort, a beautiful 9-hole golf course located in the heart of the Rockies and the Purcell Mountain ranges. 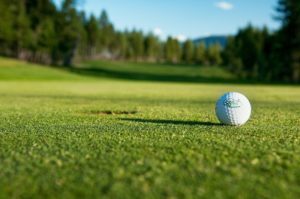 At Spur Valley Golf Resort you’ll enjoy pristine conditions and beautiful greens throughout four par 4’s, four par 3’s and a finishing hole par 5. The course layout at Spur Valley Golf Resort lets you use every club in your bag, including your sand wedge in our white silica sand bunkers and can be played comfortably in two hours. With two water features including our new water fall and fountain, coming into play on four holes be sure to bring your camera. Power & pull carts are available at Spur Valley Golf Resort. Our practice facility includes a driving range that drops 100 feet into the valley below and a practice green and bunker. The Spur Valley Golf Resort offers a licensed restaurant, The Luxor Creek Cantina, serving fantastic homemade Mexican and BBQ specialty dishes that everyone in your group or family will love. Great gluten free and vegetarian options are available as well. With some exciting new additions to our clubhouse including a covered patio and expanded pro shop Spur Valley Golf Resort will provide everything you need to enjoy your day. Spur Valley Golf Resort also offers specials on featured merchandise from golf clubs and shoes, to clothing and accessories. Save big on Tuesdays and Wednesdays at Spur Valley Golf Resort and enjoy 9 holes for only $16 all season long. We also have senior rates every day, memberships & 10/20 pass books available. Book your tournament or corporate event with Spur Valley Golf Resort. Fun, relaxing golf for everyone. Play Spur Valley Golf Resort.